I've had a bit of a heavy heart and mind the past few days. Over this last year, I have learned that creating something...anything, always seems to help with the heaviness when it sneaks about. So this week has brought somewhat of a crafting blizzard into our home. The remnants of it are everywhere and I don't yet intend to put them away into their rightful places. My environment tends to mirror my inner workings...and for right now, it is all a pinch of a mess. But the crafting has been fun! I finally got to meet my college roommate's new baby girl the other night and I gathered enough supplies around our home to make some of those wool-felt blocks that are featured in Amanda Soule's book ~The Creative Family. That was therapeutic because of the meditative repetition...and also because it was the first project I have ever hand sewn! A sweet little accomplishment that made me smile. 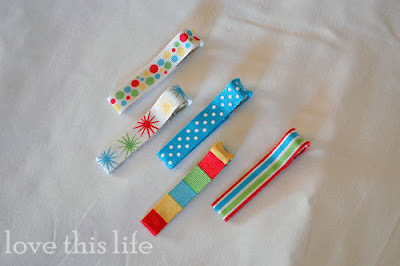 And then I started making her some of these sweet little barrettes...and I haven't really stopped since. I don't know exactly what I am going to do with a bunch of barrettes...because I don't wear them and my children don't wear them. Well, Journey will only wear them for as long as we ooh and aah over how cute they look on her. But once the oohing and aahing stops (because it can't go on ALL day long)...she rips them off of her head. I guess I'll just have a great stash of gifts for little ones who like barrettes. The crafting brought with it some delusional affirmations as well. I dreamt up my own etsy shop and thought of all the things I could sell...which were things I have never even tried to make. Nevertheless, it has been a nice break to the ramblings of my mind and it has shown me how very centering it is to create. Now...does anyone need any barrettes? I'm with them. The etsy shop is not delusional. It could be a real possibility ... don't know when, but it could be! I'm loving the openness and boldness of your blogging as of late. And those barrettes are darling! Are they velcro inside? these are so sweet and whimsical. and I'm with you, on the needing to create something when life is hard or stressful or feeling heavy hearted. it clears my mind and centers my body and opens my heart all at once. These barrettes are adorable. Are those from Creative Family too? I bet you could make an etsy shop for barrettes and build from there! SOunds like fun! I've been wanting to make some of these little hair clips but I haven't found the ribbon I want yet! :) Great job!!!! It's good for the soul!